The Shelly Manne exhibit in the RhythmThe systematic arrangement of musical sounds, which creates a flowing and/or syncopated pulse. ...! 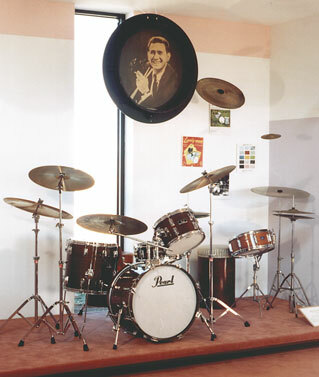 Discovery Center includes a variety of drums and cymbals that Manne played during the 1960s and 1970s, as well as reproductions of pages Manne appeared on in old Leedy DrumA hollow cylindrical shell of any size that has a head stretched over one or both ends and is b... Company catalogs. Suspended above the exhibit is a large photo of Shelly Manne, framed in a manhole casing. The piece is a relic from the nightclub Manne opened around 1960 in Hollywood – Shelly’s Manne-Hole – that provided a popular venue for West Coast jazz players and Manne’s own group. Manne, who was at the forefront of the West Coast jazz movement of the 1950s, is remembered for his strong sense of swing and the melodic quality of his playing. 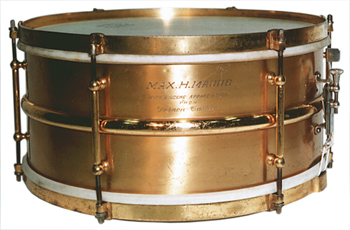 Manne’s wife, Florance (‘Flip’) donated the drumset to PASThe Percussive Arts Society is a music service organization whose mission is to inspire, educa... More in 1996. Manne died in 1984. 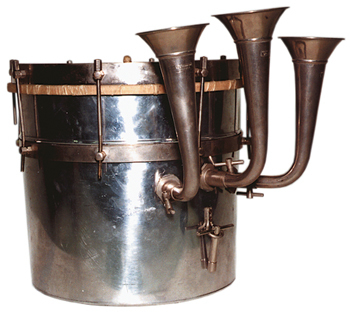 Along with the drumset came other items from Manne’s personal instrument collection. 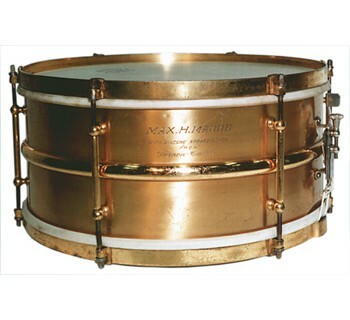 These include the gold-plated snare drumOne of the more common drums in marching bands and drumlines and the primary drum of a drum set... and cuica shown below, as well as Manne’s ‘L.A. 4’ flight cases, an antique glockenspielAn instrument that contains tuned metal bars mounted on a rectangular frame. The bars usually c..., native American and clay drums, large and small boobams, slit drums, doumbeks, waterphones, kalimbas and other small instruments. These instruments are on display elsewhere in the museum. Emil Richards, a 1994 PAS Hall of Fame inductee, was instrumental in obtaining this collection for the museum.